One would not expect to see a relic from the age of dinosaurs step out of the woods, but as we watched the Black Rhinoceros move into the clearing in the Masa Mara Reserve in Kenya we were reminded again that relics do exist. The prehistoric beast that was the Black Rhino’s cousin inhabited the earth 60 million years ago. Obviously now extinct, that hornless Rhino was the largest land mammal of all time standing 18 feet tall, 27 feet long and probably weighing 25 tons. Today, there are five species of Rhino, the Javan Rhino (critically endangered), the Sumatran Rhino (critically endangered), the Greater One-Horned Rhino (vulnerable), the White Rhino (threatened), and our guy in the picture below, the Black Rhino (also critically endangered). Black Rhinos stand 4-5 feet tall, 14 feet long and can weigh up to 4,000 pounds. European hunters are responsible for the early decline of Black Rhino populations where they were killed in vast numbers for food or simply amusement. They were considered as vermin and were exterminated at all costs. Settlers that arrived in Africa in the early 20th century continued the senseless slaughter. Black Rhinos have two horns, and occasionally a third small posterior horn. Between 1970 and 1992, 96 percent of Africa’s remaining Black Rhinos were killed as a wave of poaching rippled through Kenya and Tanzania and spread throughout Africa. Today, fewer than 2,500 Black Rhinos exist. Though they (and other Rhino species) are heavily protected, populations are still declining in certain areas. Today, worldwide populations of all five Rhino species is estimated at only 10,000 to 11,000 animals. Interestingly enough, what is believed to have precipitated the massive killings in the 1970’s was the soaring price of crude oil which created enough wealth for young men in Arab countries to satisfy their craving for knife handles made of Rhino horn. The extensive poaching of Rhino horn is also driven in no small amount by a growing demand from some Asian peoples for use as folk remedies the medicinal value of which is virtually non-existent. In a desperate attempt to protect Rhinos, conservation officials are resorting to tranquilizing Rhinos and sawing off and destroying their horns. 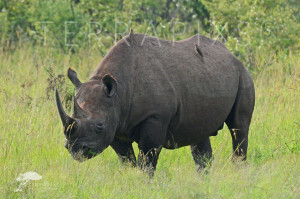 International trade is Rhino, and many other wildlife parts, is prohibited but continues to be rampant. So if you are ever tempted to purchase such items please remember that man, as the apex species on this planet, has a moral responsibility to care for and protect the ecosystem that supports us all.